The media has given us a lot of love lately! And it’s kept the Press page on our blog busy – with so many updates! In yesterday’s HT Brunch, I got mentioned along with my husband! 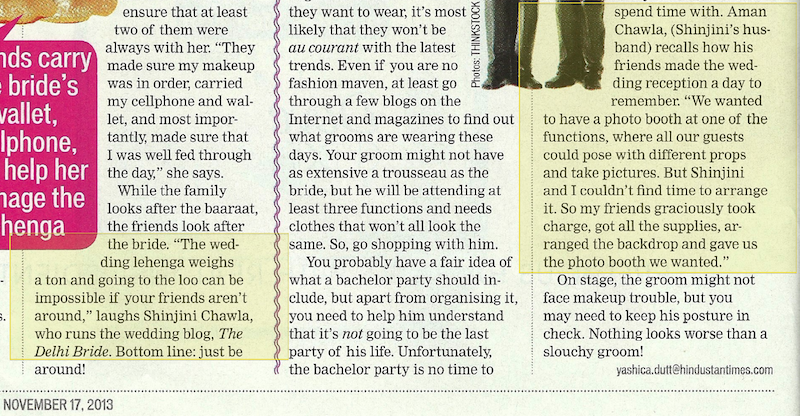 That’s him mentioning the photo booth that you’ve read about in thedelhibells: Reception post. Remember how I told you he made it all happen in 24 hours? Well, he couldn’t have done it without his band of awesome friends! And Yashica got my name right this time 🙂 The article in HT Brunch was a part of their Wedding Special issue, and you can read the whole article here. 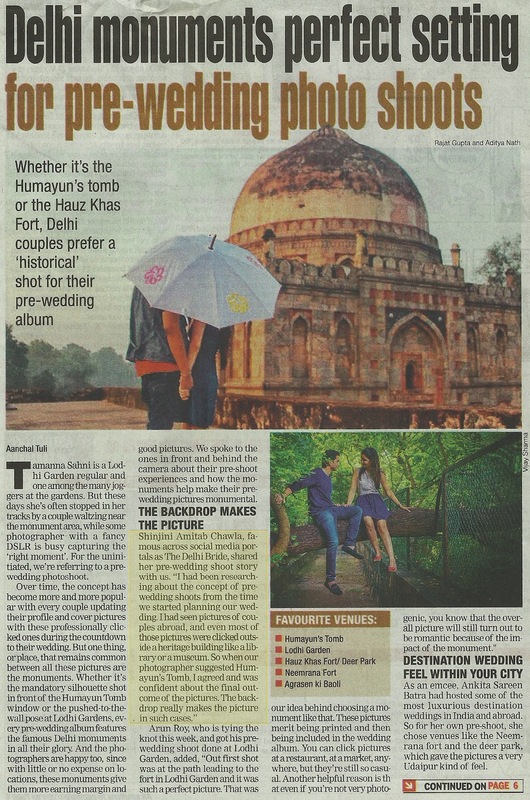 There was also a mention in today’s Delhi Times – on the front page! The article was written by Aanchal Tuli, who was an absolute delight to talk to! The article continues on the last page, where my wedding photographer Tarun Chawla is also mentioned 🙂 As is Mahima Bhatia, who was featured on our blog very recently with some beautiful shots she clicked of bride Samvedna. 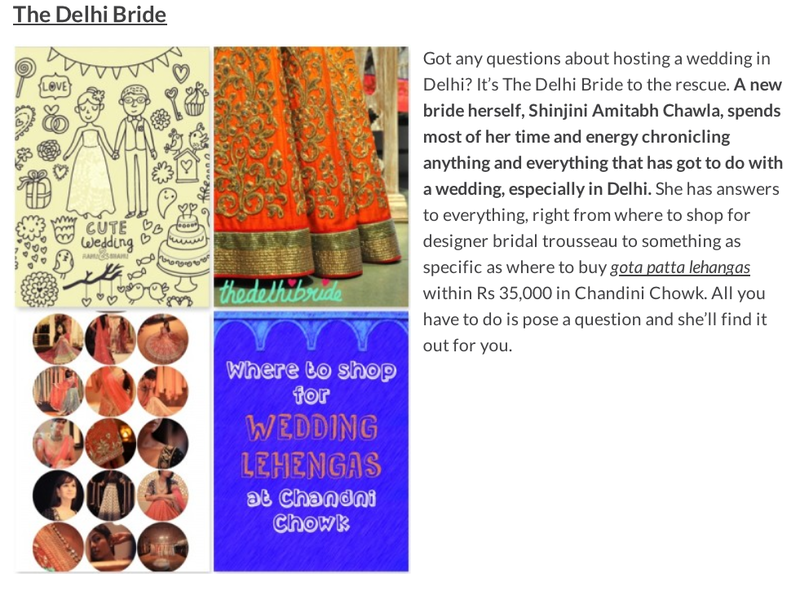 I love the images they picked from the blog – looks like an apt representation of the variety & styling you’ll find here 🙂 Once again, absolutely honoured to be part of a list that includes heavyweights in the wedding blogging world, such as Maharani Weddings, Wedding Sutra & Style Me Pretty! With so many wedding specials doing the rounds these days, which one has been your favourite so far? Any article you found really useful? Share it in the comments! Next article Are you a Bangalore bride?